This ruling by the Commissioner of Patents clarifies what types of amendments to claims may be allowed during oppositions and post grant, and in which cases the patentee has to provide justification for amendment. Unfortunately, in applying the rules, the commissioner got it wrong and allowed an amendment that causes embodiments not previously within the scope of protection to henceforth be protected. Rafael Advanced Warfare Systems LTD opposed an attempt to amend the description of patent application no. IL 188066 titled “System and Method for Identifying Shooting”, which was filed in December 2007 by Optigo LTD and Elta Systems LTD, transferred totally to Elta in December 2011, and published for oppositions at the end of July 2012. On 25 October 2012 Rafael filed an opposition, submitting a statement of case in February 2013. Instead of responding, in August 2013, Elta applied to amend the application. Rafael opposed this as well, filing a further statement of case, and in January 2014, Elta filed their statement of case. Under Regulation 102, the main opposition is suspended until the allowability of the amendment is determined. The parties forwent the right to a hearing and the ruling on the amendment was given based on the written submissions. 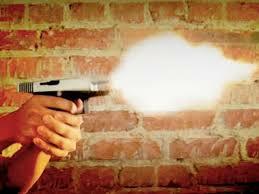 In brief, the application claims identifying shooting from the Infra Red flash from gun muzzles. 1. 2. A method for use in detecting and locating on of a muzzle flash event, the method comprising sensing electromagnetic radiation by an imager comprising a non cryogenically cooled Photo Detector Array (PDA) sensitive in at least a portion of the NIR and SWIR spectrum, thereby imaging the sensed electromagnetic radiation, wherein said electromagnetic radiation propagating towards the PDA undergoes filtering for selectively passing towards the PDA the electromagnetic radiation of one or more spectral ranges of relatively low transmission in atmosphere –of said at least portion of the NIR and SWIR spectrum, said sensing imaging having an integration time shorter than 10-2 s.
2. 1. A method for use in detection detecting and locating of a muzzle flash event, , the method comprising sensing electromagnetic radiation by an imager comprising a non cryogenically cooled Photo Detector Array (PDA) sensitive in at least a portion of the NIR and SWIR spectrum, thereby imaging the sensed electromagnetic radiation, wherein said electromagnetic radiation propagating towards the PDA undergoes filtering for selectively passing towards the PDA the electromagnetic radiation of one or more spectral ranges of relatively low transmission in atmosphere for said at least portion of the NIR and SWIR spectrum; and wherein said sensing imaging having an integration time shorter than a duration of the muzzle flash event; the method comprising applying staged processing to pixel signals of said PDA for consecutively reestimating the occurrence of said muzzle flash event while reducing the amount of data to be processed at each stage, and wherein said staged processing comprises a stage of parallel in-pixel processing. 3. The method of any one of preceding Claims 2, wherein said parallel in-pixel processing comprising analyzing the time dependent signals from each pixel independently of other pixelssensing is at least in part performed within the NIR spectrum. 4. The method of any one of preceding Claims, wherein said imager comprises at least 10,000 pixelssensing is at least in part performed within the SWIR spectrum. 24. A device for use in detection and location of a muzzle flash event, the device comprising an imager comprising a non cryogenically cooled Photo Detector Array (PDA), sensitive in at least a portion of the NIR and SWIR spectrum, and a filter of electromagnetic radiation configured and operable for selectively passing therethrough spectral bands corresponding to relatively low transmission of the electromagnetic radiation in atmosphere for said at least a portion of the NIR and SWIR spectrum, said sensing PDA having an integration time shorter than 10-2 s.
25. A device for use in detection and location of a muzzle flash event, the device comprising an imager comprising a non cryogenically cooled Photo Detector Array (PDA), sensitive in at least a portion of the NIR and SWIR spectrum, and a filter of electromagnetic radiation configured and operable for selectively passing therethrough spectral bands corresponding to relatively low transmission of the electromagnetic radiation in atmosphere for said at least a portion of the NIR and SWIR spectrum, the PDA having an integration time shorter than a duration of the muzzle flash event; the device includes a processing system adapted for applying staged processing to pixel signals of said PDA for consecutively reestimating the occurrence of said muzzle flash event while reducing the amount of data to be processed at each stage, and wherein said staged processing comprises a stage of parallel in-pixel processing. 26. The device of Claim 2526 or 27, wherein said parallel in-pixel processing comprising analyzing the time dependent signal from each pixel independently of other pixels the PDA at least partially being sensitive within the NIR spectrum. 27. The device of any one of Claims 26 24 to 2826, the PDA at least partially being sensitive within the SWIR spectrumwherein said imager comprises at least 10,000 pixels. Following these amendments, applicant requested replacing sensing with imaging in claims 15, 16, 17, 20, 21, 22 and 23, and deleting the words sensing being in claims 43-36 with appropriate grammatical amendments. In claims 5-11, 18-19, 28-34, 38-42 the applicant requested adding the word wherein with appropriate grammatical amendments. Applicant requested cancelling claims 5, 19, 30 and 44. Elta claimed that the amendments were supported by the specification and that none of the amendments widened the scope of protection and thus fulfilled both Sections 65 and 66 of the Law. Rafael countered that the amendments widen the claim-set, change the essence of the invention and claim elements not is the original application. Rafael argued that “detecting and locating” is wider than merely detecting in that the invention now enables working out where the flash comes from. Therefore the amendment should not be allowed. Similarly, imaging includes sensing, but provides additional functionality and enables obtaining results not previously protected. Substituting SWIR for NIR enables using a sensor that does not work in the NIR part of the spectrum. Furthermore, the proposed amendments to claims 3, 4, 26 and 27 are substantial enough to effectively amount to new claims. Elta responded that nothing claimed extends beyond the scope of the original specification. SInce the opposer did not provide evidence supporting his allegations, they should be thrown out under Regulation 102c, and the opposer should be considered as accepting the amendments. The opposer considers that having to detect locate is narrower than merely detecting and should be allowed.slocating is supported on page 13 lines 17-21, page 53 lines 20-22. Similarly, “an imager comprising a non-cryogenically cooled PDA” is narrower than merely a PDA, since it has to be an imager. Support is found on Page 10 line 6, page 7 lines 20-23 and 28-29. In general, the very sensing is wider than imaging, as imaging requires sensing, but also forming a picture. In general, adding additional stages to a process is inherently narrowing. Thus any amendments that narrow the scope of protection should be allowed. This ruling was issued by the Commissioner, Asa Kling. Opposers are not required to submit evidence where the issue revolves around an internal logic. The mere failure to submit additional evidence cannot be taken as abandoning the opposition. The proposed reading of the regulations was thus rejected. Citing Section 29 of the Latent Law, post acceptance, the allowable amendments to claims are those allowable post-grant. i.e. amendments allowable under Sections 65 and 66.Such amendments have to be supported by specification and cannot be a widening in the scope of the protection requested. In addition, Regulation 95a allows post allowance amendments only on paying the requisite fee and stating the purpose of the amendment (so that the commissioner can ascertain that the amendment is indeed a narrowing of the scope of protection). Citing then deputy commissioner Axelrod in IL 101537 Unipharm vs Merck, 30/4/2003 Section 21b, the applicant has to provide explanations to persuade the examiner that the amendments should be allowed. This was upheld by the Supreme Court in 11194/04 Polyvid polystyrene foam vs. Eli Givati et al. Essentially, according to the Commissioner, he has no choice but to allow amendments that correct a mistake in the claims and claim that which should have been claimed originally, if doing so does not widen the protection, but the onus is on applicant to show that this is indeed the case. The question is really whether after the amendment, the claims can catch something that would otherwise not be considered infringing. As to locating, since detecting and locating is narrower than merely detecting, it was allowed. Similarly, a choice of a specific type of imager is narrower than any detector and was allowed. The Commissioner considered SWIR as relating to the range 0.7 microns to 1 microns and NIR as relating to the range 1 micron to 3 microns. Since the range is smaller, he allowed this amendment. (I believe that this amendment is wrong as I will explain below). As to claims 2 and 25, these also narrow the claim scope, but their intent was not stated and is not self-evident. Consequently, these amendments were rejected, as were the corresponding amendments to dependent claims 3 and 26. Claims 4 and 27 that replaced wavelengths with pixel densities were considered new claims and were rejected. Any amendment not obviously narrowing, was not allowed, since the onus was on applicant to explain why additional or seriously amended claims should be allowed. Adding words like ‘wherein’ and correcting grammatical errors was allowed. In conclusion, the amendments to claims 1, 5-24, and 28-52 were allowed, as was deleting original claims 5, 19, 30 and 44. The new clauses in claims 2 and 25 for ‘the method comprising’ and ‘the device includes’ were rejected. The amendments to claims 3, 4, 26 ans 27 were likewise rejected. I am not familiar with the term SWIR. Wikipedia considers SWIR as being below 1.4 micron and NIR as being from 1-3 microns. see here. As defined by Commissioner Kling, the SWIR range is below that of the NIR range. The amendment protects a system using a sensor of wavelengths below 1 micron, whereas prior to the amendment it would be an acceptable work-around. Clearly, this is a widening of the scope of protection. If, for example, visible light was claimed and an amendment specified green light, or part of the spectrum from red to green, this would be a claim narrowing, since the new range is totally within the older range. That is not the case, at least not according to the Commissioner’s own definition. If he sees this, I’d expect him to correct the ruling. If not, there are grounds to appeal since the Commissioner is correct legally, but wrong scientifically. For those not with me on this, try drawing Venn diagrams. on the face of it you seem to be correct, the amendment broadened the scope of protection rather than narrowing it.